Elevating the experience of every patient at Houston Methodist. We believe superior medical care incorporates healing elements that feed the human spirit. From chaplaincy education to arts integration to nursing excellence, we seek to enhance programs that promote a culture of hope and healing. World-class care has been a hallmark of the Houston Methodist patient experience throughout our nearly 100-year history. This commitment to excellence begins with our nurses. Working on the frontlines of health care with poise, skill and compassion, the approximately 5,200 nurses in our hospitals are at the heart of our mission to keep the patient at the center of all we do. An anonymous contributor has generously established $250,000 endowments in support of nursing excellence at six Houston Methodist community hospitals, and we are committed to building those endowments to $1 million each. Hospital leadership along with the leader of nursing at each community hospital will decide how best to direct these funds to support nurses at the hospital. For more information, contact donor@houstonmethodist.org or 832.667.5816. Caring for the human spirit is as much a part of our goals and culture as treating patients for illness. Houston Methodist has identified the vital connection between faith and medicine, and provides multiple spiritual care programs throughout the system. Medical care is more effective in environments that promote healing. The only center of its kind in the country, Center for Performing Arts Medicine (CPAM) brings the healing power of arts to Houston Methodist patients. Support of CPAM provides therapy utilizing the arts in clinical patient care and research to harness the broadest potential of the arts in therapy, rehabilitation and human performance. These health care specialists guide patients through all aspects of their hospital experience. Patient navigators help patients understand their diagnosis and treatment plan and perform follow-ups with patients to ensure compliance with appointments and medication. Support of this program has led to the expansion of this service throughout our hospital system. Our nurses are the clinical backbone of the hospital. Nursing is practiced expertly and compassionately by professionals committed to the complex needs of patients and their families. As the medical environment expands, nurses are required to continually enhance and strengthen their knowledge and skills in today’s technologically-advanced, highly complex health care environment. Houston Methodist’s expansive vision for the future is not limited to the patient care, research and education that occurs at our Texas Medical Center campus. We are proud to provide exceptional medical care at our locations throughout the greater Houston area—including specialty care, clinical trials and more. Gifts may support the excellence fund at each of the hospitals or a specific program or area. A Houston Methodist program that provides specialty patient care to uninsured and underserved patients received another multi-million dollar gift from Occidental Petroleum Corporation. Community health clinics provide essential care for those who are uninsured or living outside of the health care mainstream. The Houston Methodist Community Scholars Program partners with local health clinics to allow residents and fellows to train in a real-world environment under the guidance of accomplished physician mentors. Patients receive coordinated, specialty care that is often unavailable in community clinics. Occidental’s $6 million gift expands the existing program to include new services in palliative care, as well as a more in-depth look at health disparities in our communities. The gift adds a palliative care fellowship; establishes the Occidental Petroleum Health Outcomes – Quality of Life Improvement Program; and creates an endowed chair in quality and outcomes research – all focused on improving specialty health care services in a community clinic setting. The Occidental Palliative Care Fellowship will enhance cancer and other services provided at a Houston-area Federally Qualified Health Center. Palliative care is a wide-ranging area, offering treatment for pain, depression, loss of appetite, difficulty sleeping, anxiety and any other symptoms that may accompany an illness or treatment. The Occidental Petroleum Health Outcomes – Quality of Life Improvement Program is a collaborative research effort with Texas A&M University, led by Bita Kash, M.D., director of the Houston Methodist Center for Outcomes Research. The program will research and analyze patient data to examine the Community Scholar Program’s impact on health outcomes, cost of care and quality of life. An Occidental Petroleum Centennial Chair in Quality and Health Outcomes Research will be held by a senior researcher who will focus on strategies and policy to close the health disparity gap for underserved and uninsured patients. With the addition of a $500,000 matching gift from Rusty and Paula Walter, the total philanthropic impact of Occidental’s commitment is $6.5 million. Occidental’s gift brings their total contribution to the Houston Methodist Community Scholars Program to $10 million. Houston Methodist’s Community Scholars Program began in 2013 to provide care for neurology patients in Federally Qualified Health Centers and free clinics across the greater Houston area. In 2015, the program expanded to include cardiology, ophthalmology, hematology/oncology, pulmonology, endocrinology and nephrology. Houston Methodist’s community benefits program has provided operational support for clinical and mental health programs, in-kind lab and other specialty care services to more than two dozen Houston area agencies since 1994. The Klein’s generous gifts honor a Houston Methodist tradition of faith that goes back to the hospital’s inception and was brought to life when the original statue was created by sculptor Wei Li “Willy” Wang. 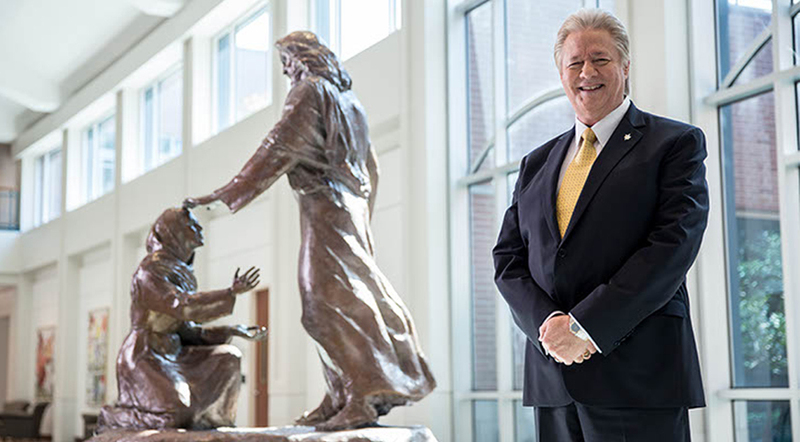 It was erected as a memorial to longtime board member W.R. “Randy” Smith, who had dreamed of having such an enduring reminder of Christ’s healing ministry displayed in the main lobby of the hospital. Smith’s friends, led by current Board Chair Ewing Werlein Jr., gave generously for the original gift in Smith’s memory. The two sculptures made possible by the Kleins bring the total number to eight. Besides the original artwork in Houston Methodist’s flagship hospital, reproductions of ‘Jesus – The Great Physician’ are featured in the lobbies of Houston Methodist San Jacinto, St. John, Sugar Land, Willowbrook and West hospitals. For Rev. Klein – a patient who flat-lined and saw angels wing-to-wing around his hospital bed – the statues represent the daily miracles that sprout from faith-based medicine. Homegrown Woodforest National Bank's community spirit and generosity set the course for Houston Methodist's newest community hospital. The bank's $1 million commitment 15 Houston Methodist The Woodlands Hospital's first major philanthropic gift- and the largest to any Houston Methodist institution outside the Texas Medical Center. Woodforest National Bank and Houston Methodist The Woodlands Hospital represent different industries but share a common goal: to help care for the communities they serve. Their similar missions presented the opportunity for a natural collaboration, and in late 2016, Woodforest National Bank committed $1 million to name one of the new hospital's most public places and support its excellence fund. "Not only are we thankful to Woodforest National Bank for its remarkable gift, but we’re also extremely proud that our institutions share common values and the commitment to serve The Woodlands and surrounding communities with integrity and purpose,” says Debra Sukin, regional senior vice president and CEO at Houston Methodist The Woodlands Hospital. The excellence fund advances the hospital’s highest priorities, accelerating innovative research and physician recruitment in key clinical areas to bring leading medicine to the community. The hospital’s sky plaza – Woodforest Bank Sky Plaza – is among the most prominent spaces in the new hospital, a busy public area for patients, visitors, physicians, administrators and staff, and the place for future hospital and community gatherings. With its roots in Texas, Woodforest National Bank has grown into one of the strongest banks in the nation, with more than 740 locations in 17 states, and employing more than 5,000 people. Woodforest employees proudly serve through community lending, investments and volunteer service hours. Every day they live out the “Woodforest Commitment” of earning their customers’ loyalty by offering the highest level of customer service and competitive products and services while giving back to their communities.